'' Today the tovve is really good Amma!'' declares my ten year old son at the dinner table. Before I can smile a modest thank-you he promptly asks ''Ajji sent it right?''. I try not to sound like an indignant ten-year-old with a deflated ego and say ''No, I made it!''. His spontaneous 'Oh!'' in reply is hastily replaced with a placating ''Great job Amma, looks like you have a bit of Ajji's touch in your cooking today, what say?''. When you are a foodie, take not any chances and irk the cook. Especially if she happens to be the only cook around!! Guess being born a South Indian invariably brings with it the fondness for rice and all things coconut. 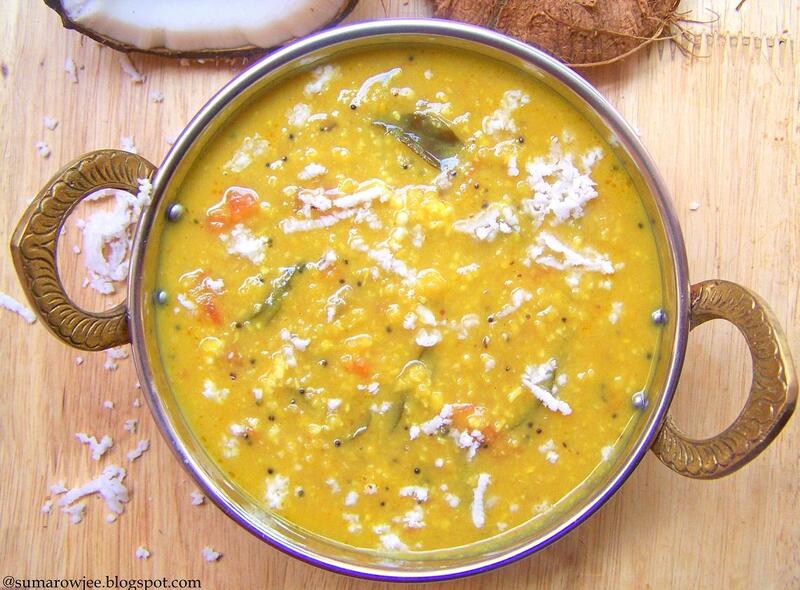 From chutneys to payasams to simple everyday garnishes, coconut finds its way into most cooking. And when life hands us more coconut than we normally use, more often than not, it goes into Kobbari Tovve. 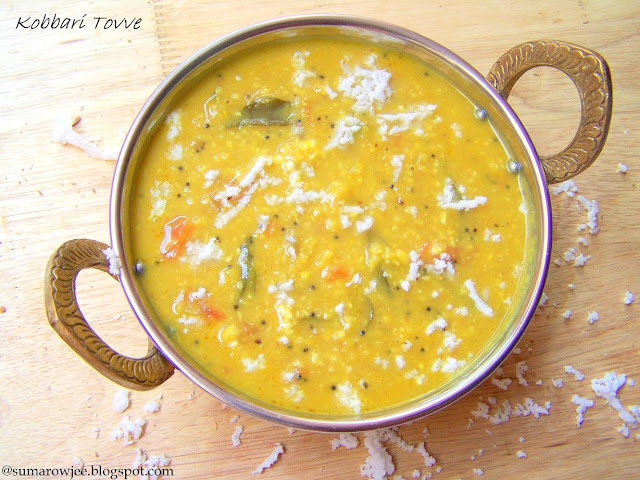 Tovve is basically a lentils based dish either with or without vegetables, mostly without sambar powder in it. Needless to say, kobbari or coconut is the star ingredient in this dish. A spice mix made with roasted coriander seeds, cumin and fenugreek seeds add that subtle but very certainly there aroma and taste to the dish. These spices are roasted and ground together and stored for a couple of months like sambar powder, rasam powder and the rest. But since everyone doesn't have this spice mix at home, I have made it using the three individually. The taste of the tovve is pretty much close to what my mother makes, though may not be exactly the same. If she lived closer by, probably I could have got each of these dishes made by her..sigh! Spicy with the green chillies, subtle but flavorful and loaded with fresh coconut, it may not be entirely disappointing to try this. This makes about 4 1/4 cups of tovve, I would suggest to maintain the level of spices (the coriander, cumin and fenugreek) and alter the amount of the rest to suit your taste. This tastes good with good quality hing, generous amount of chillies and enough tamarind and jaggery to balance it out. Water - 1/2 cup if needed. Pressure cook the dal with the turmeric and enough water till the lentils are well cooked and soft, but not completely mushy (this cooked dal will be about 3 cups and a little more) Set aside till the pressure drops completely. In a thick bottomed pan, heat a teaspoon of oil. Add a dash of hing, add the chopped tomatoes and a bit of salt. Cover with about 1/4 cup of water and cook covered till the tomatoes are very soft. Add the cooked dal, the spice powders, jaggery, tamarind pulp and the chilli paste. Add the coconut and salt to taste. The tovve is meant to be on the thicker side. Add about 1/2 cup of water if needed to adjust the consistency. Bring to a simmer, cook for about 10 minutes on low heat. Check and adjust the seasoning if needed. Turn off the heat. Heat the remaining oil, add the mustard. Once it sputters, add the curry leaves and the hing, Pour over the dal and mix. 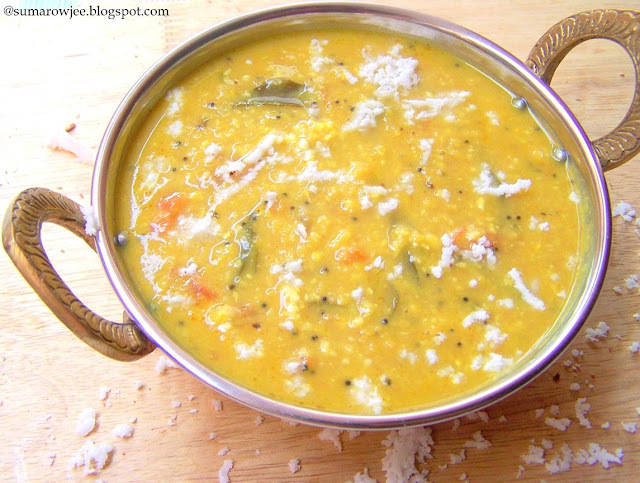 Serve with hot rice, ghee and uppu hacchida menasinakayi (deep fried sun-dried stuffed chillies). I like the flavor best when it is warm (not hot), even better a few hours after its cooked. Wow that is so tempting and delicious!! so yummy!!! All children think that their grandma's cooking is the best. I get this all the time from my daughter. Thank you for sharing these lovely recipes. However this one has some gaps which you may like to address. 1. At what stage is the coconut to be added? 2. There is no mention of chilli paste in the ingredients. 3. The note mentioned next to grated jaggery is not there. Hi Sonita - The green chilli paste has been mentioned as chillies, ground in the ingredient list. 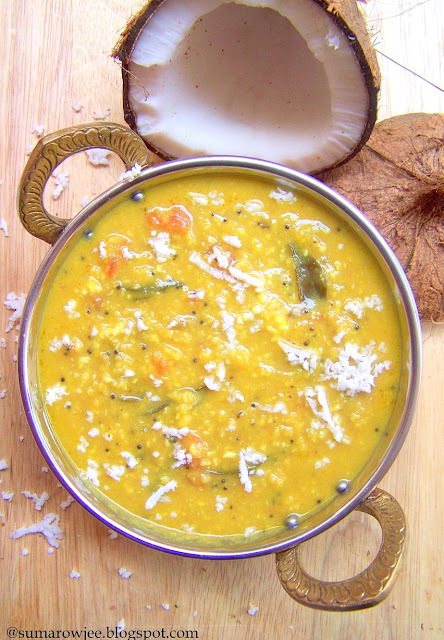 The coconut is to be added at the later stage as mentioned in the recipe. Sorry about the typo note on jaggery, have edited. The dal looks so tempting. I am going to try this on weekend. Nothing can beat a granma's recipe...tried and tested. Love the hint of both jaggery and tamarind.